This article appeared in Sacred Web 3. This issue is SOLD OUT. To order other back issues of Sacred Web, click here. In order to understand these difficulties more fully, first, we must better understand our own intellectual history. The modern human community, especially as it is constituted in the West, is heir to what we perhaps self-servingly call, “the Enlightenment,” occurring in Europe almost five-hundred years ago. Modernity (and its progeny, modernism), which has been the project of the West for the last several centuries, intensified this ideal in ever more practical and systematic ways. Modernist thought, therefore, not only affected our mental structures, but also our cultural and social systems shaped by the tools of science and technology. Modernism, therefore, can simply be called “systematic rationality” practically applied to human culture. Post-modernism expresses its challenge in this way: All thinking, including rational and supposedly “objective thought” (even science itself) goes on within the context of an interpretive community (a tradition, according to Hans-Georg Gadamer, or a paradigm, in the view of Thomas Kuhn) which bequests to us pre-determined standards of rationality, judgements and actions whereby we make all our decisions.8 These standards and premises are in fact often the opposite of what they appear to be, non-rational and unsupportable from a strictly rational point-of-view. Upon this basis some forms of post-modernists “deconstruct” the modern world. The spirit of modernity which discarded its traditional wisdom in favor of the truth of a “value-free” science and the power of technology is now being challenged. Post-modernism’s hope is to create a passage beyond the failed assumptions of modernity in order to radically reorient culture in a new direction.9 The most current and popular mode of post-modern thought attempts to reveal the hidden, cultural constructions of modernism and also to deconstruct such fundamental concepts as humanity, God, nature, gender, ethnicity, etc., in order to break their hold upon culture. Theirs is often a fierce relativism which leaps to the assumption that there is nothing but cultural construction in human experience—that there exists no other world but this. We have lived, first, in a world where the ruling paradigms of science challenged both the notion of revelation and the possibility of mystery. And second, we are challenged now by a relativism that not only deconstructs the rationality of the Enlightenment paradigm, but raises further questions about the possibility of transcendence. Accordingly, all is a “language game” invented by humans who can no longer even claim independent, Cartesian subjectivity. To a large extent, the defining characteristic of biblical scholarship in the modern period is the attempt to understand Scripture without reference to another world. Born in the Enlightenment, modern biblical scholarship has sought to understand its subject matter in accord with the...image of reality that dominates the modern mind. The notion, however, that there could be another reality, a world of transcendence, (though not confirmable either by modern rational-empirical thought, or post-modern linguistic relativism), remains a possibility that can only be confirmed by something which the Tradition itself names theoria and praxis, the contemplation of Transcendence through personal experience and practice. From one perspective (shared by both the wisdom traditions and by Scriptural texts), multiple dimensions of reality exist, many of which are beyond rational-empirical confirmation. We humans, however, have had and can still have commerce (connection) with these realms. From the particular perspective of the Semitic faiths (Judaism, Christianity, and Islam) revelation as self-disclosure is necessary if we are to know these realms and establish a relationship that affects who we are and how we live within them. Revelation, then, is gratuitous, a divine grace, a gift of self-donation made by Transcendence as an Immanence which necessarily takes anthropomorphic forms. It is this divine address which expresses the mystery of our existence. As mystery it attracts us toward a destiny that both includes and is beyond the narrow limitations of this world. The wisdom traditions hold this mystery before us in order to address the totality of our existence and not simply the narrow spectrum which we experience as consensus reality. We experience it ourselves in the context of spiritual practice, in the multivalent forms of sacred Scripture, and in a subtle and deep inner awareness of the grand unity which holds us and our world in some larger whole. Accordingly then, Scripture, as revelation, is “sapiential discourse” (wisdom teaching) addressing us, and not simply “self-talk.” For that reason it has normative authority over us in a most interesting and crucial way; not as a science through rational-empirical proof, or esthetically as a linguistic construct, or even as a wise and venerable product of human culture. Its authority comes through participation in and praxis of the sacred text itself. In light of Tradition (especially Semitic and Middle Eastern tradition), and as a literature of sapiential discourse, the emphasis and power of Scripture is essentially the effect created by the dynamic encounter between the text and the reader. Scriptural traditions have made the interaction between reader and text and the changes that occur in that encounter a central aspect of its mystery and authority.17 How that interaction is understood and interpreted is, in reality, the proper subject of hermeneutics; i.e., interpretation theory. The meaning of the Scripture is, of course, multiple (or polyvalent), and these “meanings” are first of all functional and secondarily substantial. As part of the sapiential tradition, Scriptural discourse strives for something beyond mere ideation or logical proof. It does not so much seek to capture or prove reality as it “really” is. Rather, its aim is to extricate the reader from that which is considered to be our own nonessential and illusory relationships to reality. Simultaneously, it seeks to reveal that which is most significant: that humanity is itself a divine work of art, a transitional creature in the midst of recreation. This understanding is a critical point for any modern or post-modern encounter with the mystery of the sacred text. The Scriptures seek, therefore, to extend and transform the horizon of the individual in such a way that reality itself is grasped differently. It does this through the confrontation between the new world of the text and the “old world” of the reader. In this context (combining the thought and phraseology of Heidegger, Gadamer and Ricoeur), there is a confrontation between horizons at the precise place where the human self is released from its entrapment and where a “new being” can be created in the self-disclosure of Divine Being through the power of the Word.19 It is this personal encounter between reader and text that involves a profound challenge and questioning of who we define ourselves to be. Scripture challenges the initial positions held by the reader. It challenges our limited, egoic definitions of “self,” and questions us, “What do you make of your lives?” This is a door opening to mystery. This challenge does not imply simple human submission to the view of reality contained within the sacred text, but rather a full participation as a partner in dialogue (text and reader) within its truth. We are asked to step into its deep and mysterious waters, to participate in and practice its insights in order to know its truth. Mysteriously, the sacred text actively promotes and provokes such encounters. It is deliberately provocative and seeks to engage reconsiderations of the practical concerns of the human world. It is this engagement which establishes the human dialogue with mystery, a dialogue that fuses the immediate horizon of the reader with the transcendent horizon of the text. In constructing a hermeneutics of sacred and sapiential discourse, therefore, the first priority must be to understand and account for this primary function, dialogue, which creates a new frame of reference in which we are invited to participate. Within this frame of reference, therefore, the “game” of sapiential discourse becomes most apparent. Sacred Scripture presupposes and insists not only upon the facticity of transcendence, but also, on transcendental possibilities which emerge for the reader as participant or player, while the “game is being played.” Transcendence and participation in its possibilities is another name for what we might call the “rules” of the “sapiential game” in which the player either “succeeds” in playing or does not. It is the transcendent mystery of this other world which has “thrown us the ball” and which serves as the “playing field” to which we the readers and as players are invited. We are called from beyond ourselves to go out of ourselves and enter the mystery. To speak of “success” in winning the game (as Gadamer does) means that the readers or participants in the world of sapiential discourse must suspend conventional rules and the everyday, human refusal to play the game. The players must participate willingly in the mystery in order that through the “rules” of the game and its tasks they may become transformed in an immanent and personal way. Such a call and challenge is what Cardinal John Henry Newman celebrated in his writings as the mira profunditas of the sacred text, the depth of its significations and the richness of its play, “a richness derived from the mystery to which it is the introduction, of which it is the unfolding. The Scriptures are for us a depth, a complexity, yes even a difficulty.”22 We are summoned into its mystery, we are transformed as we play within its field, and we move beyond our present horizons toward something utterly new, our ultimate destiny in God. 1 Each of the world’s great Traditions honors various texts as sacred. While not all faiths give the same valence or meaning to the term “Scripture,” nor does each claim the same understanding for a doctrine of revelation or inspiration, nevertheless, they each authenticate certain texts as sacred and therefore authoritative. Clearly in the western traditions, Judaism, Christianity, and Islam have strong doctrines of revelation, being founded upon “the Book(s)” of sacred Scripture. In the eastern traditions, certain texts rise above religious literature in general to gain significant authority for the community, while not claiming revelation in the same strict sense as used in the West. It is not the purpose of this paper, however, to compare or adjudicate these various claims, but simply to acknowledge the spectrum of sacred texts in Traditions which speaks the Mystery of transcendence and immanence for particular communities. For the purposes of this paper we will call all such honored and authorative texts Scripture, because they contain the sacred mystery reaching out to touch and teach humanity. 2 The ancient discipline of hermeneutics is the venerable practice of understanding the multiple layers of interpretation existing vertically within the text. The modern discipline of hermeneutics is essentially horizontal in nature; that is, historical and linguistic. Modern hermeneutical enquiry does not attempt to study what is independent of time or language, as do the formal sciences. Instead, the objects of investigation are the cultural artifacts of humanity observed within the context of language within time. This historical and linguistic complexity is commonly described as a network of inter-textual relationships. Using multiple theories and models, hermeneutics attempts to understand both the historical-linguistic webbing and the cultural artifacts which have been created within it. For a detailed study of hermeneutics vis-à-vis the Scriptural text see David Tracy’s Plurality and Ambiguity: Hermeneutics, Religion and Hope (SF: Harper and Row, 1987) and Andrew Louth’s Discerning the Mystery: An Essay on the Nature of Theology (Oxford: Clarendon Press, 1983). 3 Seyyed Hossein Nasr speaks of this recovery in the following quote from his Gifford Lectures: “During the past few decades for many attracted to the call of tradition, the meaning of tradition has become related more than anything else to that perennial wisdom which lies at the heart of every religion, and which is none other than the Sophia whose possession the sapiential perspective in the West as well as the Orient has considered as the crowning achievement of human life. This eternal wisdom from which the idea of tradition cannot be divorced and which constitutes one of the main components of the concepts of tradition is none other than the sophia perennis of the Western tradition, which the Hindus call the sanatan dharma, and the Mulsims al-hikmat al-khalidah (or javidan khirad in Persian)” (Knowledge and the Sacred 68). 4 From “To Hear the Stars Speak: Ontology in the Study of Religion” in Fragments of Eternity (Ed. Arvind Sharma. Doreset, UK: Prism Press, 1991). 5 For a concise and lucid presentation of the development of western thought see Richard Tarnas’ The Passion of the Western Mind: Understanding the Ideas that Have Shaped Our World View. (NY: Balantine Books, 1991). 6 The writings of the post-modernists are prolific. For a sampling see Jacques Derrida’s Margins of Philosophy (Trans. by A. Bass. Chicago: University of Chicago Press, 1982), Michel Foucault’s The Archaelology of Knowledge (Trans. by A.M. Sheridan Smith. London: Tavistock, 1972), Richard Rorty’s Philosophy and the Mirror of Nature (Princeton: Princeton University Press, 1970), Jean-Francois Lyotard’s The Postmodern Condition: A Report on Knowledge (Trans. by Geoff Bennington and Brian Massumi. Minneapolis: University of Minneapolis Press, 1984), and Fredric Jameson’s The Political Unconscious: Narrative as a Socially Symbolic Act (Ithaca, NY: Cornell University Press, 1981). 7 Two texts which make this critique are Lawrence E. Cahoone’s The Dilemma of Modernity: Philosophy, Culture, and Anti-Culture (Albany: SUNY Press, 1988), and Hannah Arendt’s The Human Condition (Chicago: The University of Chicago Press, 1958). 8 The two fundamental texts expressing these views are Hans-Georg Gadamer’s Truth and Method (NY: Crossroads, 1985) and Thomas Kuhn’s The Structure of Scientific Revolutions (Chicago: The University of Chicago Press, 1962). 9 In order to understand how far this critique has extended see Paul Feyerabend’s Against Method: Outline of an Anarchistic Theory of Knowledge (Thetford, Norfolk: Thetford Press, 1975) and Brian Appleyard’s Understanding the Present: Science and the Soul of Modern Man (London: Pan Books, 1992). For a more reconstructive post-modernist critique see Charlene Spretnak’s States of Grace: The Recovery of Meaning in the Postmodern Age (NY: HarperSanFrancisco, 1991). 10 This philosophical conclusion (some would add, dead end) was reached by Michel Foucault in his book The Archaeology of Knowledge, but the glimmerings of such a perception began to emerge earlier in the thought of Nietzsche. 11 This critique has been ably made by the Charlene Spretnak in State of Grace: The Recovery of Meaning in the Postmodern Age. (NY: HarperSanFranciso, 1991). 12 From “Postmodernism’s Impact on the Study of Religion,” in Journal of the American Academy of Religion LVIII/4: 653-670. 13 From Knowledge and the Sacred (NY: Crossroads, 1981), 93-94. 14 From “Root Images and the Way We See the Primordial Traditions and the Biblical Tradition” in Fragments of Eternity (Ed. Arvind Sharma. Dorset, UK: Prism Press, 1991). 15 From Logic and Transcendence (Trans. Peter N. Townsend. NY: Harper and Row, 1975). 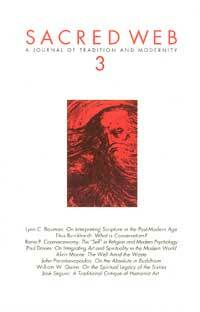 16 See Andrew Louth’s The Origins of the Christian Mystical Tradition: from Plato to Denys. (Oxford: Clarenden Press, 1981). 17 One cannot help but call to mind such passages as, “Thy words were found, and I did eat them; and thy word was unto me the joy and rejoicing of mine heart: for I am called by thy name, O Lord God of hosts” (Jeremiah 15:16) “For the word of God is quick, and powerful, and sharper than any twoedged sword, piercing even to the dividing asunder of soul and spirit, and of the joints and marrow, and is a discerner of the thoughts and intents of the heart?” (Hebrews 4:12). “Say: If the ocean were ink wherewith to write out the words of my Lord, sooner would the ocean be exhausted than would the words of my Lord, even if we added another ocean like it, for its aid” (Qur’an XVIII: 109), and, “If all the trees on earth were pens and the ocean were ink with seven oceans behind it to add to its supply, yet would not the words of God be exhausted in the writing: for God is exalted in power and full of wisdom” (Qur’an XXXI:27). See also the Qur’an VI:91-92. 18 The biblical scholar Sandra Schneiders, explaining the “reader-response” theory in terms of sacred texts, points out that we read Scripture not merely for information but for transformation (13). To read for transformation is a spiritual task requiring cognition through the spiritual senses. This means that the reader of Scripture must read with a consciousness that goes beyond intellect and reason and that opens a dialogue between the text and the life of the reader. Schneiders explains:“The primary concern of the scripture reader whose objective is transformation lies through and beyond this informational interpretation. A second dialectic is inaugurated in which the meaning arrived at by informational interpretation becomes the sense (what is said), but the referent (what it is about) is the world of the reader or the reader-in-the-world. Meaning now means existential significance, not truth in the abstract that one remains free to engage or ignore, but truth in the concrete that by the very fact of being grasped seizes its subject... the existential meaning of the text is dialectically engaged with the world of the reader (16).” Sandra M. Schneiders. The Revelatory Text: Interpreting the New Testament as Sacred Scripture. S.F. : HarperSanFrancisco, 1991. 19 Gadamer and Heidegger in particular defines hermeneutics as a particular form of scientific (deductive-nomological) methodology based upon Dilthey’s earlier hermeneutical theory of Geisteswissenschaften. Gadamer also situates his work in the distinctions made by Edmund Husserl between lived experience, Erlebnis, and scientific experience, Erfahrung. For Gadamer, the understanding and interpretation of language is also always within a history which encompasses the whole of lived experience and any transformations of viewpoint that occur in that experience. In this regard, Gadamer emphasizes that the growth of understanding does not occur in objective isolation, but in dialogue, and especially when that dialogue becomes a “fusion of horizons.” The life-world of each speaker or writer, listener or reader is a finite horizon of practical experience in and through which humans come to understand anything, and yet understanding in dialogue is always a mutually shared understanding and a transformation of the initial positions taken of all the discussion partners. Participation in a conversation therefore becomes an integration of meanings which parallels a fusion of the distinctive horizons of each participant. “Understanding...is always the fusion of these horizons which we imagine to exist by themselves....In a tradition this process of fusion is continually going on, for there old and new continually grow together to make something of living value,...” (Gadamer 273). Upon this basis, explains Paul Ricoeur, “Understanding a text, then, is only a particular case of the dialogical situation in which someone responds to someone else” (1976, 22). “What emerges in its truth,” from understanding constituted in dialogue, says Gadamer, “is the logos, which is neither mine nor yours and hence so far transcends the subjective opinions of the partners in dialogue...” (331). See Martin Heidegger’s Being and Time (Oxford: Blackwell, 1962), Hans-Georg Gadamer’s Truth and Method (NY: Crossroads, 1985, and Paul Ricoeur’s Interpretation Theory: Discourse and the Surplus of Meaning (Ft. Worth: The Texas Christian University Press, 1976). 20 The role of game as a means of formative development has a venerable history defended in the Greek paideia by Plato and Aristotle. See Werner Jaeger, Paideia: The Ideals of Greek Culture (N.Y.: Oxford University Press, 1945). In more recent times the category of “game” has become a central part of the philosophy of language in the work of Wittgenstein; see Philosophical Investigations (London: Blackwell, 1953). For Gadamer, in Truth and Method (N.Y.: Crossroads, 1985, 91-119), the concept of play is a pivotal feature in his philosophy of hermeneutics. The classical study of play is that of Johann Huizinga, Homo Ludens (Boston: Beacon Press, 1955). 21 The unique features of game playing are what commends this particular metaphor so strongly to hermeneutics. To play a game is to allow the game to act authoritatively over the players through a particular set of rules. The following synthesis describes the ways in which the game acts authoritatively over its players. First, the subject of action in a game is not the persons playing, but the game itself. The players act in reaction to tasks the game itself imposes, and the game becomes, in a certain sense, master of the player. Second, the game comprises a set of rules and principles to which the participants must adhere, and which determines in part the participants? own goals and aspirations. Third, to see whether the game works or succeeds is the game’s attraction, for it exercises the abilities of the players in new ways. The game is not simply what is codified in the rules or reflected in a set of strategies, but the priority is always upon the playing of the game. The playing of the game as praxis remains its central feature. Thus the game both determines the actions of its players and is nothing other than the practical actions themselves. This description of game playing illustrates the kinds of meaning which Gadamer and others see in a text. Games, texts, works of art, all have an essential priority or authority over the individuals who encounter them, or who “play their game.” Reading a text, like playing a game, is an entry into a new domain projected upon the reader (interpreter) or player by the text or the rules of the game. The reader as “player of the game” is placed in a new domain as he or she submits to its norms and requirements. Thus, in order to be played, the game itself must exercise authority over the player. A game, a text, a work of art has normative authority, not because it compels its audience to discover its author’s intention, but because it raises what some have called “a claim to truth,” and the players’ or readers’ participation is an experience of that truth (See, for example, Georgia Warnke in Gadamer: Hermeneutics, Tradition and Reason. Stanford: Stanford University Press, 1987, 49, 56). The “truth” of a game or a text becomes real only when played. Outside of the game itself it has no concrete shape or reality. The truth must be realized in the experience, participation, or play, for the content of a game is made real by the actions, attitudes, and practices of its players in the act of playing. Truth understood in this manner, in the context of the game realized by the playing of it, is dynamic rather than static. Its concrete existence is capable of changing and its realization involves a constant transformation of the player through participation and practice. Its meaning is never absolute, but changes with the circumstances of each of its instances of realization. 22 See Andrew Louth’s important study, Discerning the Mystery (Oxford: Clarenden Press, 1983, 110).